TV presenter Chris Packham has written an open letter to Ant and Dec asking them to end "abuse of animals" in I'm A Celebrity... Get Me Out of Here! The duo preside over the show's "bushtucker trials", in which contestants eat live insects, or endure close encounters with creepy crawlies. Writing in the Radio Times, Springwatch presenter Packham described the trials as "out of date" and "silly". The award-winning ITV series is set to return on Sunday. Packham said that teaching young viewers that killing for "exploitative 'entertainment' is acceptable" is "a shame that I imagine neither of you will want to take to your graves". He wrote: "The problem is that animals such as snakes, spiders, crocodiles, rats and many invertebrates are already misunderstood and thus unfortunately vilified, despite the incredibly important roles they play in the world's ecosystems and our lives. "By orchestrating a fear of them among your contestants, I'm afraid you're reinforcing and exaggerating a terrible ignorance and intolerance of these remarkable animals." Packham was also dismissive of the programme's use of consultants to advise on animal welfare, saying: "I can guarantee that some animals are harmed during production, because they are fragile or easily stressed. Or simply killed, as they are in your bushtucker trials." He added: "The show has been running for years now. Surely it's time for it to mature, for you to accept that, as pillars of the British broadcasting community, you should put an end to this inhumane, embarrassing and destructive aspect of an otherwise great show." Packham also said the eating of invertebrates and animal body parts such as eyes and testes made a mockery of the needs of those from some cultures who have no choice but to eat such things. 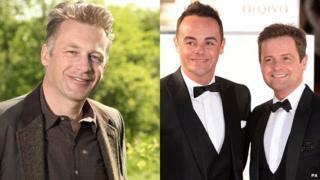 ITV responded to Radio Times, saying: "Ant and Dec are the presenters of the show, and as such are not involved with the formatting of the trials, which are devised by the show's producers. "ITV takes animal welfare very seriously and expert handlers are on hand at all times." Packham is not the first person to criticise the show's treatment of animals. DJ Tony Blackburn, who won the first series in 2002, said in 2012: "I wouldn't have done the show if I'd had to eat bugs. They supplied Tofu for me. I don't like the way they treat creatures. I think it's cruel." ITV was also fined £1,660 in 2010, after contestants Gino D'Acampo and Stuart Manning killed and cooked a rat as part of the show. The RSPCA in New South Wales, Australia - where the reality show is filmed - said it was "not acceptable" an animal had been killed as part of a performance. D'Acampo and Manning were originally charged with animal cruelty themselves, but the charges were dropped after ITV admitted responsibility.